E-Art Tie Dye is a husband and wife apparel company that has long been creating a strong presence in our festival, as well as many others. Errett and Vanessa Brown will return to Canandaigua again this year, and we talked with them about their clothing art and what we can expect to see in July. 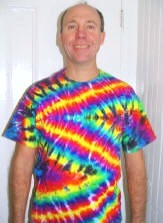 Errett Brown has been making his own tie-dyed products since 1987. Though E-Art sells most of their products online and at festivals these days, he started off in a very different scene in Tahoe, California. Perhaps with one of the most interesting histories, Errett’s business would soon combine with his now-wife Vanessa’s tie-dying endeavors to break into a slightly different market. Errett says that the combined company’s name, E-Art Tie Dye, is a secret clue having to do with the ‘E’. He cryptically alludes to the fact that it has “something to do with more than one thing.” Perhaps anyone attending the Canandaigua Art and Music Festival this July could do some investigating. Regardless of the mystery enshrouding the company’s name, Errett says that one of his favorite aspects of the Canandaigua festival is the great feedback and repeat customers who look for their booth each year. Errett describes the clothing as “fun,” “bright,” and “unique,” which we agree has an eye-catching appeal. Errett’s wife and business partner, Vanessa Brown, says that she gets the most positive feedback from mothers. They love the clothing because it is durable and their children love wearing it. She asserts that the clothing stands up to hundreds of washes while still maintaining its appearance. 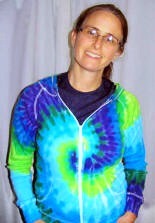 Even though children especially love the tie-dye, she says that she sees the same joy in customers of all ages. For those who have not had the pleasure of seeing E-Art’s work yet, it offers bright and fun clothing in sizes and styles for all ages. 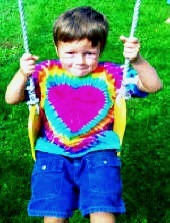 Errett tells us to expect some new items and styles this summer, including new tie-dye dresses. If you want to get a sneak peek of what’s in store, stop by E-Art’s website.